Are you using your SharePoint to its full potential? As a key part of their Customer Experience Management (CXM), organizations around the world use SharePoint for websites, extranets, employee collaboration, web content management, business intelligence and more. 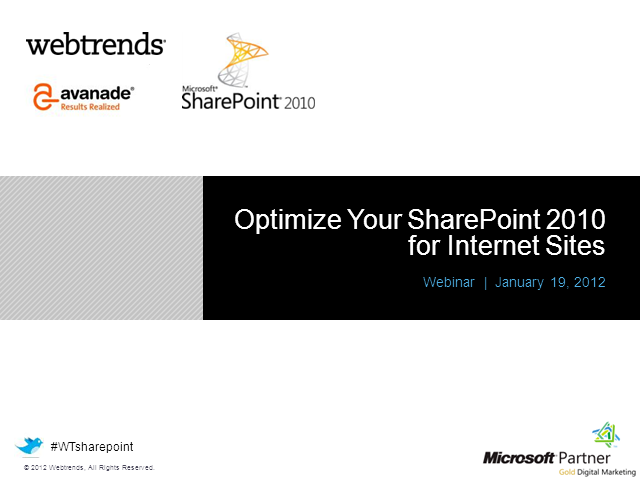 Join Microsoft, Webtrends, and Avanade for this free webinar to learn how you can fully harness the power of SharePoint 2010. Webtrends, a Microsoft Preferred Analytics Provider for SharePoint 2010, provides a comprehensive, integrated solution companies can use to test, target, measure, segment and optimize to improve content, usability, search and collaboration across the enterprise. Avanade provides business technology solutions and managed services that connect insight, innovation and expertise in Microsoft technologies to help customers realize results. Avanade has helped thousands of organizations in all industries improve business agility, employee productivity, and customer loyalty. > Unlock the value of SharePoint across your enterprise. > Gain productivity and increase engagement through optimized content. > Measure return on investment using the powerful integrated solution of Microsoft SharePoint 2010 and Webtrends Analytics for SharePoint 2010. What if you could access visitor-level data as it happens? Now you can—and we’ll show you how. Join us for a special webinar where you’ll be among the first to preview our latest game-changing innovation. Stellen Sie sich vor, es wäre möglich auf die Vorlieben und Aktivitäten Ihrer Besucher zu reagieren noch während sie sich auf Ihrer Seite befinden, und die Ergebnisse zu beeinflussen bevor sie die Seite verlassen. Keine vergebenen Chancen – sondern Chancen zum richtigen Zeitpunkt ergreifen. Stellen Sie sich vor welche Möglichkeiten und welches Umsatzpotenzial sich dadurch ergäben. Diese Technologie gibt es nun. Durch Webtrends Streams wird die Art und Weise wie Digital Marketeers ihre Online Strategie angehen vollkommen revolutioniert indem das leidige Problem der Zeitverzögerung entfällt – nicht nur Real-Time, zur richtigen Zeit! Nehmen Sie an unserem Webinar teil, in dem wir Ihnen Webtrends Streams vorstellen – das revolutionäre neue Produkt, welches das digitale Marketing für immer verändern wird! Everyone is talking about the Social Enterprise and how it can transform your organization – whether it’s unlocking expertise, connecting teams and people, or improving communications with customers. Ultimately, the real purpose of driving this business transformation is to improve business productivity and increase profitability. But how do you measure the success? We have invited Charlene Li of Altimeter Group, an industry leader in social business strategy, to join us and share her insight into understanding and measuring this growing market. Charlene will share her real-world experience and how she sees the Social Enterprise changing the way business is done, how to connect measurable concepts around engagement to ultimate business success, and the direction and impact the social enterprise will have on the future. As the social enterprise continues to grow, organizations are more challenged now than ever to understand how these emerging collaboration tools are being used to fuel business productivity and ROI. All too often, measurement strategies are ignored, or considered too late in the process to ensure that the right success metrics are being considered and able to be measured. In this webinar, learn how to measure what matters for the social enterprise and how to create a culture of measurement and optimization that can permeate the organization and help drive adoption, contribution, and ongoing collaboration. Webtrends Streams is the revolutionary new product that will change the way digital marketers drive top- and bottom-line results. This technology enables immediate intervention to drive customer conversion. Webtrends and Axceler, both Microsoft Gold Certified Partners, provide government agencies with a dynamic solution that combines business insights and administrative controls enhance user experience and governance. Together, Webtrends and Axceler offer the ability to improve usage and increase productivity, all while providing enhanced security and control. The social web is no longer a new channel. However, the volatility, fragmentation and unique characteristics of the social web continue to challenge brands seeking to quantify the success of social media initiatives, and tie them back to business outcomes. In this webcast, John Lovett, Senior Partner at Web Analytics Demystified and author of Social Media Metrics Secrets, will introduce four types of metrics for measuring the success of social media programs, and provide actionable take-aways that can be used immediately to help organizations develop a consistent and repeatable measurement program. The Road to Measurement is a journey, not a destination. And, it starts with one simple decision – the decision to measure. But, what comes next is the big, scary question – what to measure? This webinar is designed to empower you with the knowledge you need to get started on a measurement strategy that will unlock intelligence that helps you drive engagement and adoption, while putting in place the foundation for answering the tough questions regarding ROI and the overall business impact of your intranet strategies. The social web is no longer a new channel. However, the volatility, fragmentation and unique characteristics of social data continue to challenge brands. They are now seeking to quantify the revenue impact of social media initiatives, and to tie these initiatives back to business outcomes. According to research conducted by Altimeter Group, the primary business impact of social media for many brands today is less about revenue generation, and more about insights that help brands meet customer experience goals. While social media insights are critical to business decisions, the imperative to quantify investments in the social channel, as well as the returns from this investment, continues to escalate. Through the design and execution of a well-formed social measurement strategy, it is possible to measure the revenue impact of social media, and position brands for success in this rapidly evolving channel. In this webcast, Altimeter’s Susan Etlinger will present the findings from her research report, “The Social Media ROI Cookbook.” She will provide actionable take-aways to help organizations develop a social measurement strategy. Susan will introduce a top-down and bottoms-up approach to measuring social, and will describe four key factors critical to assessing an appropriate measurement mix. The success of digital marketing programs hinge on a marketer’s understanding of his or her customers. Sounds familiar, sure, but the marketing landscape has altered. The ways brands interact with customers have changed, and the ability to understand customers across digital channels requires a new approach. Traditional web tracking techniques were not designed for the breadth of channels, devices and speed that fuel today's digital interactions. And while web analytics is the logical hub of interactive channel analysis, a multifaceted digital landscape requires an approach that breaks down the walls between analytics and business, eliminating passive insights and making digital data actionable. Forrester Research is redefining this new era of web analytics as "digital intelligence." Firms, regardless of size, that leverage digital intelligence can use the take-aways from this webinar to deliver relevant and coherent customer experiences, and create sustainable competitive advantages within their markets. Learn how best-in-class marketers are dramatically increasing customer acquisition by delivering more relevant experiences that improve campaign conversion. Consumers are increasingly demanding that their favorite brands be more attuned to their personal interests. But how do you deliver relevance to your digital marketing efforts? Join industry experts for a free webinar to find out how to deliver the most relevant content to your target audiences across digital marketing channels (web, mobile and social), and get remarkable ROI. Are you optimizing your SharePoint for Internet Sites environment? If you've already made an investment in SharePoint for Internet Sites, ask yourself: are you measuring and optimizing that investment? Webtrends, a Microsoft-preferred analytics solution for SharePoint 2010, provides an easy-to-implement, comprehensive solution to measure, test, and optimize content, design, usability, search and collaboration. Join Microsoft and Webtrends for this free webinar to learn how you can significantly improve the results of your SharePoint for Internet Sites initiatives. Mobile is not social media and social media is not site. Marketing channels are clear. What is not always clear is how to achieve marketing success across digital channels. Marketing is going through a period of significant evolution. The era of easily compartmentalized silos has been usurped by the Splinternet, a large-scale fragmentation of devices, data access, and technology standards. The Splinternet upends many of the assumptions upon which interactive marketing is based and, at the same time, presents both challenges and opportunities for marketers. In this webinar, Joe Stanhope, Senior Analyst with Forrester Research, will present new research insights into the current state of marketing fragmentation and how it is changing the way companies approach digital marketing. A new interaction and revenue stream for news publishers? Digital marketing success depends on measuring what matters and gathering insights that drive action and learning. Absorb digital analytics best practices, learn from best-in-class case studies, and get the information you need to excel in interactive marketing with the Digital Analytics channel.